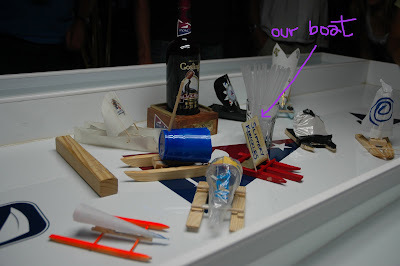 Its the beginning of Goslings/IYAC Rain Gutter Regatta Racing season in Newport. My team of lookers (referring to my boys of course) gathers outside awaiting instruction and materials. Ashley, from another team, shows her bag o' tricks filled with special glue, hot sauce?, a paper plate and the ever important last season DVD of Gossip Girl, Ted on MY team organizes our 'car o' tricks' with power sanders, saws, heat lamp, tank for float testing, and just about every tool he could fit into his wagon. The pressure is ON. No way can we let a team ooohing and ahhing to Gossip Girl while they paint their nails and glue their boat beat us when we are armed with enough tools and power to build a small town. 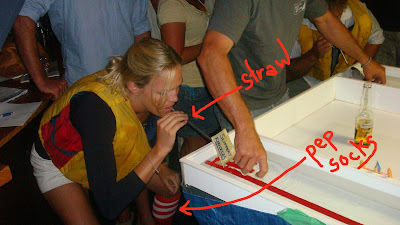 7:27pm- Teams are given boat kits, and given rules: All boats must measure no more than 6.5" long by 3" wide. Hulls must be made of the wood supplied in the kits, and sail material may be made from anything. Teams have 1 hour to build. GO! Outside, my team, hard at work. Meanwhile, inside IYAC, Justin one of the Judges(who I buttered up with a slice of pizza...shhhhh!) is measuring the water level to make sure both gutter lanes are of equal depth. All competing boats lined up...yes, there is a Solo cup sail in there...but our red rig looks pretty fast...plus, I was counting on my 'pep socks' for distracting the opposition. 8:36pm. Races begin. First up, us vs. some kiwi boys. Now it does matter how fast your boat is, but in this particular regatta, the 'life jacket switch' can make or break you...each team member needs to remove the life jacket and put it on the next relay team member before they may begin blowing for the next lap. If I thought wearing red hot knee socks were distraction, they were put to shame by the opposition next to me removing his pants only to showcase his Superman Underoos. It had been brought. As luck would have it, we took home the Gold. Goslings that is..wait, what happened to that bottle guys? Thanks to the boys Ted, Wade and Bob on the team for making me look good, since the only thing I had down was pizza delivery and removing layers (in this case the life jacket) FAST. And Geoff, thanks for taking the pics to remind us where we were last night. -Is it Wrong that I want a Gutter Race Table in my Backyard, Bradley? You guys have truly inspired us. We're building a RG track and running races in Newport Beach (NHYC). Gracias!! Perhaps there should be a bi-coastal race of some sort....or a Cannonball to Newport for competition?!? !